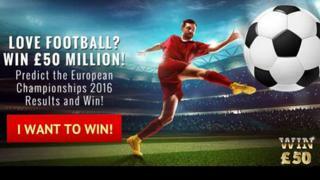 Image caption One of the ways in which Vote Leave said it acquired the phone numbers was through its football competition. The Information Commissioner's Office (ICO) has fined Brexit Campaign group Vote Leave £40,000 ($53,000) for sending out nearly 200,000 unsolicited text messages. The text messages contained a link to the campaign website alongside information about its ambitions. They were sent in the run-up to the EU referendum in 2016. The ICO said the group had been unable to prove that everyone who received the message had consented to the contact. Vote Leave said it had gathered numbers from people who had contacted it. It said the numbers came from website enquiries, texts it had received in response to other promotions and from running its own football competition. Early on in the campaign, Vote Leave launched a competition with a prize of £50m for correctly guessing the result of all 51 games in the 2016 European football championship. The odds of winning the contest - which Vote Leave funded through an insurance policy - were calculated at one in 5,000,000,000,000,000,000,000. According to the ICO, Vote Leave said that since the referendum it had deleted records of the consent, the phone numbers the messages were sent to and the volume of messages sent and received. The ICO put the figure at 194,154 messages. The email address provided on the Vote Leave website no longer works. "Spam texts are a real nuisance for millions of people and we will take action against organisations who disregard the law," said Steve Eckersley, ICO Director of Investigations. "Direct marketing is not just about selling products and services. It's also about promoting an organisation's aims and ideals. "Political campaigns and parties, like any other organisations, have to comply with the law."